What an interesting assignment this week from the cooking club anything stuffed from the list of chef’s and while we had a nice day for grilling, I thought of burgers and what could be better than a cheese stuffed burger? 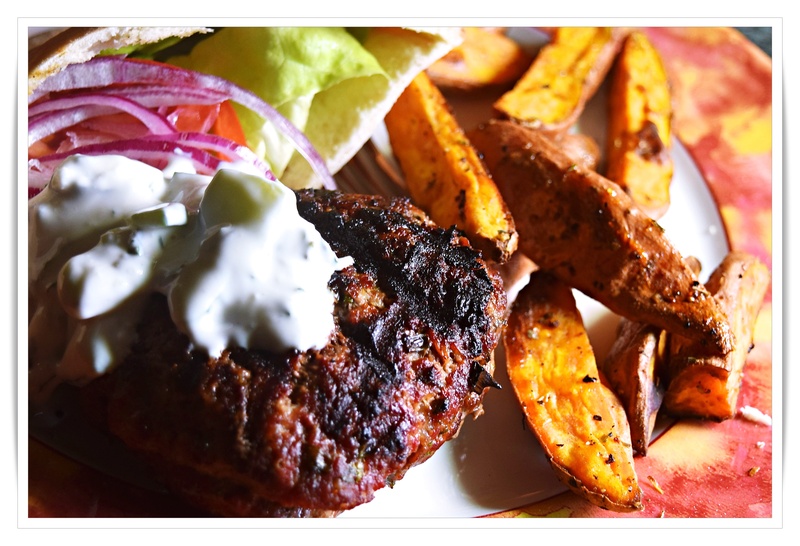 I think there are a lot of recipes out there, but I had to stick to a particular list and I came away with Mark Bittman’s inside-out lamb burgers which I adapted to be more like a Greek seasoned burger. I only made 2 burgers so not much measuring going on, but I will link to Mark’s recipe which I greatly adapted because someone around here doesn’t like lamb and I was making a smaller recipe-two burgers. I love chunky cucumber Tzatziki and made that as well to go with the burgers. Warm pita pockets were perfect and a good way to cut back on the bread…make thin patties, center the cheese on one and top with the other patty, press and seal edges, grill for 4-5 minutes on each side, obviously I love a good char on my burger. Start a charcoal or wood fire or preheat a gas grill. Season the ground meat with any of your chosen spices. Divide meat into 4 sections and shape each one around a piece of cheese, enclosing it fully. *I like the Greek seasonings from The Spice House collections and used all 3 in the burgers, but not necessary if you have good herbs and spices on hand, examples below and of course season to your personal taste.